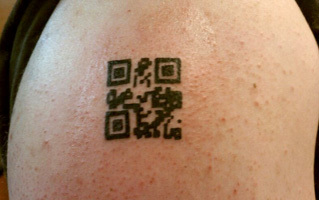 QR Code tattoo scans as "thevoice66"	 QR Code tattoos will scan if done properly. Liam O'Toole got an excellent one done in June 2008, but Chris Arkwright recently posted his that does not scan. 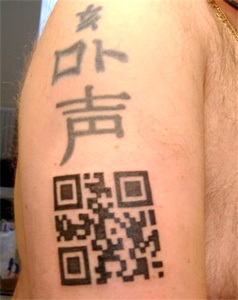 Here are some parameters to consider before getting a real 2D barcode tattoo. 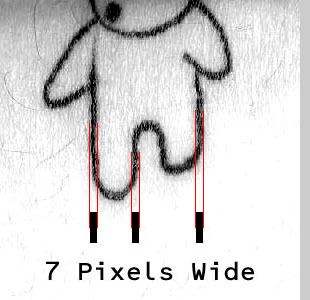 Tattoo does not scan as "NO REGRET"
I measured a healed tattoo to approximate the printing resolution of skin. The average is 42 dpi, but that leaves no room for error. I suggest decreasing the resolution to 10 dpi to allow for some distortion and blending over time. Tattoos do change with age, and that will effect the accuracy. Certain parts of the body like the shoulders and back do not expand as much. Selecting a flat surface on the back will also make it easier to scan. One last suggestion for the tattoo artist would be to under ink the tattoo instead of over filling the black areas. If the black ink expands too much, it can ruin the white areas. You can always add a dot later if you need a touch up, but you can't subtract from a tattoo. There are several free QR Code generators online. Easy to use interface by Kaywa. More advanced options by Kerem Erkan. Open source Google project ZXing.